to go directly to give a command or to answer an incoming call. • To hear general HFL information and help, say “Tutorial.” • Say “Hands free help” or “Help” any time to get help or hear a list of commands. 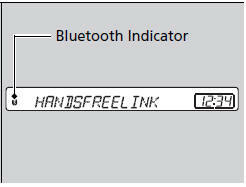 Bluetooth Indicator comes on the audio display when your phone is connected to HFL.